Percy Harvin and Jacoby Jones returned the ball to get a touchdown in the first play of the second half. Both players would receive the ball following the second half kick-off, and run the ball through numerous attempted tackles to score an emphatic touchdown. Jacoby Jones ran a record-breaking 107-yard touchdown at Super Bowl 47 to further sink the 49ers after half-time, while Percy Harvin's 87 yard touchdown was a further statement of a now-imminent Seahawks' win. Received: The Ravens player picks the ball up from the end zone without any bounces or no-one charging toward him. Jacoby Jones picked up the ball from the end zone and was backed up by his fellow teammates as he charged the ball forward, through ten defenders after some great blocking, to score the touchdown. Received: Percy Harvin received the ball on the 13-yard line after the ball bounces, by that time there are players charging toward him. With a bounce before the Seahawks' runner picked up the ball, Percy Harvin ran round tacklers and through more attempted tackles with little blocks from his teammates, running to the end zone to sink the Broncos. At a first look, because Jacoby Jones' touchdown was a record-breaking run, it can easily be pointed out as better. But one touchdown was more individual while the other was a compilation of great team work. Jacoby Jones was behind Ravens who were blocking out the tacklers, and when he picked up the ball he was able to charge forward and gain momentum while the Ravens almost paved the way for him to charge for the touchdown. One year later, Percy Harvin scored in the same situation, but with a more individual touchdown to an extent. Whereas Jones could gain momentum, there were already players awaiting Harvin, so he had to accelerate more to get through, cutting in through the players while it almost was a tunnel formed for Jones' touchdown. We'll leave the question of whose was better, to you. Comment in the section below. 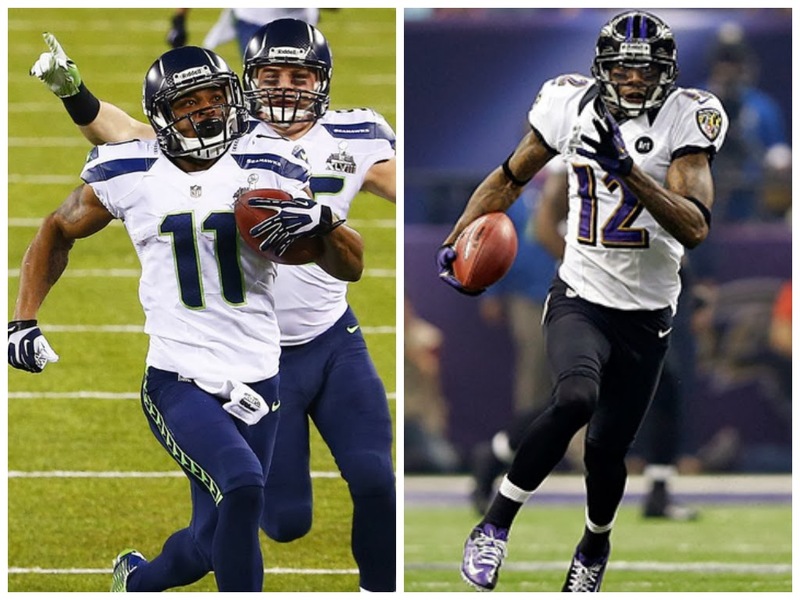 Looking at which Super Bowl second half touchdown was better, Jacoby Jones or Percy Harvin.